Fort Meade, Md. 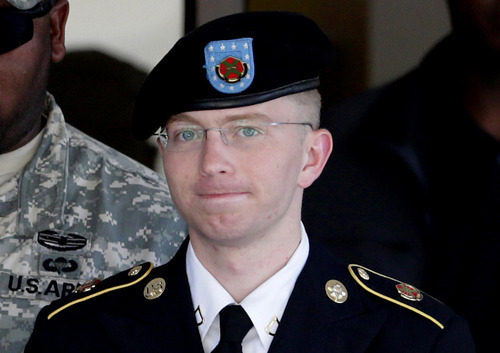 • Bradley Manning, the Army private arrested in the biggest leak of classified material in U.S. history, pleaded guilty Thursday to charges that could send him to prison for 20 years, saying he was trying to expose the American military&apos;s "bloodlust" and disregard for human life in Iraq and Afghanistan. "The most alarming aspect of the video to me was the seemingly delightful bloodlust the aerial weapons team happened to have," Manning said, adding that the soldiers&apos; actions "seemed similar to a child torturing ants with a magnifying glass." As for the State Department cables, he said they "documented backdoor deals and criminality that didn&apos;t reflect the so-called leader of the free world." The battlefield reports were the first documents Manning decided to leak. He said he sent them to WikiLeaks after contacting The Washington Post and The New York Times. He said he felt a reporter at the Post didn&apos;t take him seriously, and a message he left for news tips at the Times was not returned. The Obama administration has said the release of the documents threatened valuable military and diplomatic sources and strained America&apos;s relations with other governments. The administration has aggressively pursued people accused of leaking classified material, and Manning&apos;s is the highest-profile case. The soldier told the court that he corresponded online with someone he believed to be WikiLeaks founder Julian Assange but never confirmed the person&apos;s identity.